The Comfort XXS 66 is a result of the direct experience of professional people at EUROTEK : easy to handle, powerful, efficient, carefully conceived and designed by using top quality materials. Independantly driven double double disc brush gives extended mechanical action of the bristles on the floor for persistent dirt. The counter rotating brush gives a better overall cleaning result. The special setting of the brush plate allows a balanced gripping effect, assisting easy use. The comfort facilitates complete cleaning also next to walls and the compact washing element is lower at the sides in order to scrub under edges and crevices. Designed for the maintenance and deep cleaning of large areas with a very important reduction of cleaning cost. Very compact size and great maneuverability like walk behind models: suited for maintenance cleaning. 32 kg. of constant pressure on the brushes. Double counter rotating brush (66 cm of scrubbing width) obtaining better stability and constant pressure. Great working autonomy (till 4.5 hours) thanks to the possibility to use 4 batteries 6 V 240 Ah and to rear wheel-drive. Large load capacity tank (real load of 75 l.), resulting in reduced numbers of stops and maximum use of battery for effective operation of the machine. Ergonomic steering wheel of new design with user friendly controls and digital display. Inspection cover for fast and easy cleaning and sanification of dirt water tank. Self-levelling brush plate. Automatic detergent measuring system. Great working autonomy thanks to the possibility to use 4 batteries 6 V 240 Ah granting continuous working up to 4.5 hours. Possibility to use also 2 batteries 12V. Less battery consumption thanks to rear wheel-drive. Large load tanks made of shock and acid proof polyethylene (real load of 75 l.), avoiding frequent stops for reselling. Steering wheel with digital controls and display. Squeegee and brush plate mechanical and user friendly lifting lever: min. maintenance cost training time for the users. Scrubbing unit with double brush with brush plate made of steel for a great pressure (32 kg.) on the door resulting in an easy and deep cleaning of any kind of dirt. Rear wheel-drive on 2 wheels allows the machine to get over remarkable slopes. Detergent solution is cleansed by an external completely accessible alter, that holds any impurities, thus protecting the solenoid valve. The easy access to all internal components of machines make it possible to reduce maintenance cost. 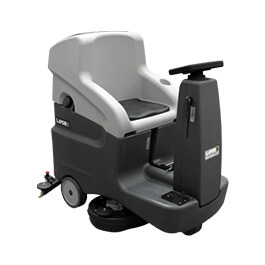 The comfortable and ergonomic seat allows the operator to work effortless for a long time, improving productivity. Its very compact size make it perfect to work in small areas where walk behind models are usually used. The use of machine makes working easier and quicker with a huge saving of time.